I’ve teamed up with 12 other bloggers to bring you an amazing giveaway. 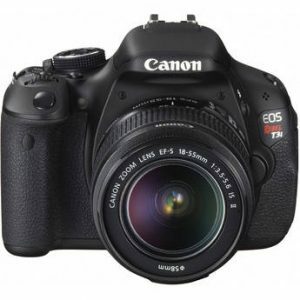 To celebrate 2013, we are giving away a Canon EOS Rebel T3i Digital Camera with EF-S 18-55mm IS II Lens Kit! To enter fill out the Rafflecopter form below. Grab those bonus entries for even more chances to win! *This promotion is in no way sponsored, endorsed or administered by, or associated with Facebook, Pinterest, Twitter or Instagram. We hereby release Facebook, Pinterest, Twitter or Instagram of any liability. This giveaway is open to entrants 18 years or older, worldwide. If our randomly drawn winner is a resident of the United States, he or she will receive the Canon DSLR described above. If a non-US winner is selected, a cash prize of equal value ($599) will be delivered via PayPal. Entrants from outside the United States should have a valid PayPal address prior to entry. Cash option also available for winning US resident upon request. The winner will be notified through email on January 29, 2013, and will need to respond within 48 hours to claim their prize or another winner will be chosen. Giveaway starts Monday, January 14, 2013 and ends Monday, January 28, 2013 at 11:59 pm EST. Once the giveaway ends, the winner will be chosen randomly using the Rafflecopter widget and contacted within 24 hours by email. This post will be updated with the winner’s name on the Rafflecopter widget once confirmed. Now that is one great contest prize! This is the first time I’ve entered a contest that required me to do more than enter my email address because boy oh boy, would I love one of those cameras! I’m constantly stealing my sister’s fancy camera so I can go take beautiful pics! What a fab contest and such a great prize good luck to everyone! What an absolutely amazing prize! Thank you, what a great giveaway! Awesome prize! Hoping for the best!